Jessica Paré Covers Fashion Magazine: Exquisite or Eighties? 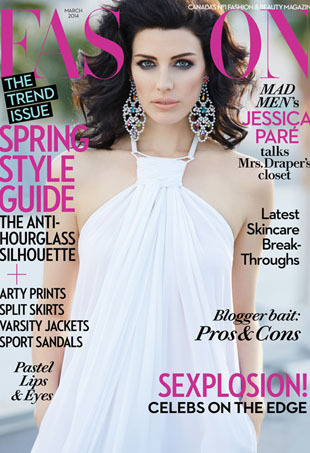 Mad Men star Jessica Paré talks style and professes her love for Montreal in Fashion magazine. From the scandalous Olivia Pope to the retro stylings of New Girl Jessica Day, the small screen has been providing a lot of great eye candy for the fashion-forward segment of its audience. Upon the launch of Janie's third collection for Banana Republic + Mad Men, we caught up with the designer to find out more. Our editor-at-large talks with Banana Republic's Simon Kneen about its second Mad Men capsule collection. The first collaboration of its kind for the retailer launches today. Surprise your retro loving friends and family with some of these vintage-inspired looks this holiday season. Everyone's favorite housewife has delivered more than a few spectacular red carpet looks.